also called Western or Sitka Columbine. 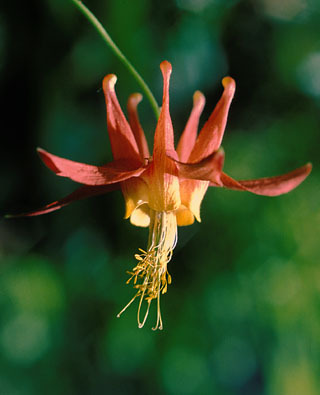 Sepals red, ⅔–1″ long [15–25 mm]; petals with yellow cups and red spurs; flower shape unique to columbines: 5 petals each form a cup in front and a long spur behind; 5 spreading sepals are petal-like; numerous yellow stamens; elongate 5-celled seed pod has 5 slender tips (second photo); leaves mainly basal on long stalks, twice ternate with 9 round-lobed leaflets; 6–40″ tall [15–100 cm]. 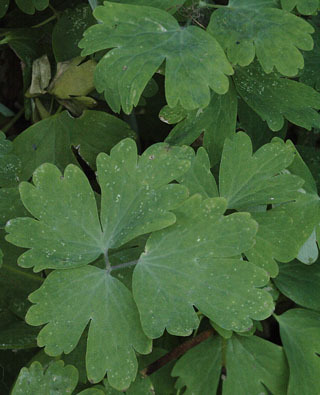 Habitat: Low to subalpine open forests, clearings, thickets; WA, OR, ID, BC, sw MT, sw AB. Natural History: Columbine species tend to be interfertile, and those that occur together owe their separate identities to the color preferences of different pollinators. This doesn’t work 100%; red-tinged yellow flowers are common where red and yellow columbines overlap in the in the northern Rockies. Like many red flowers, this one is pollinated by hummingbirds, who have no trouble lapping up nectar in the bulbous tips of the petal spurs. 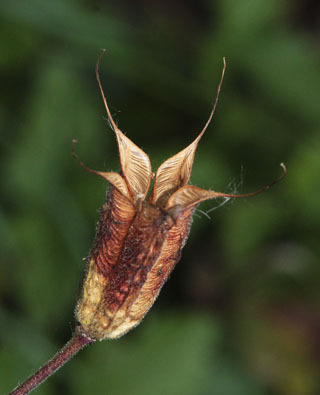 While the long spurs do serve to exclude some kinds of insects, others learn occasionally to rob the nectar by biting through the spur tip, and some of the longest-spurred species of columbine are adapted for pollination by certain very long-tongued moths.